Who's in charge of your life? Why is the Divine Mother so important? Who’s in charge of your life? Find out on the Bali Quest. I will tell you about one culture that is clear who is running things, and that is Bali. The Divine Mother is in charge. They honor Her at the largest temple in Bali, the Bisakih Temple. It is on a mountaintop, and the Balinese government officials even have a home there. I have traveled around the world for decades, and never have I found anything as incredible and wonderful as Bali. In fact, I think it is all descended from another dimension. 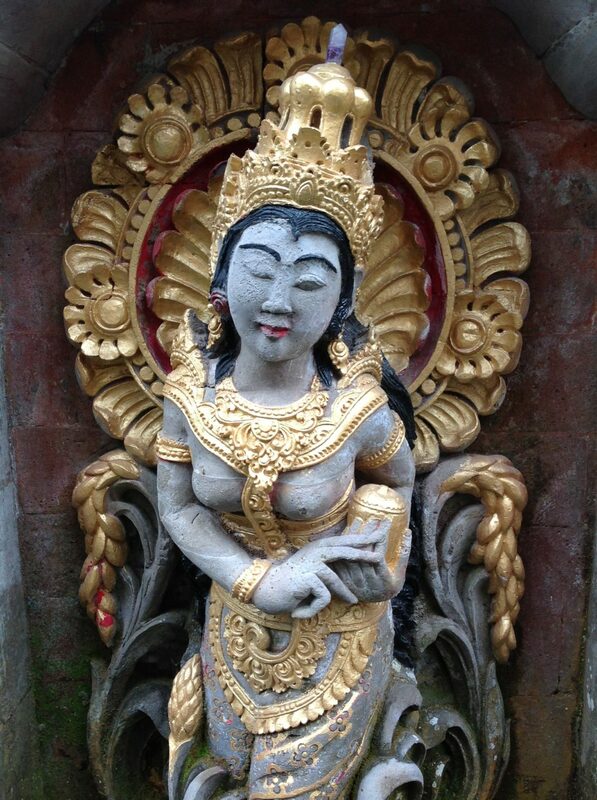 Just like on Hawaii the wise people know Madame Pele is in charge, in Bali they know the Divine Mother is in charge. Why is She so helpful and important? Well, that is like asking what would you do without the next breath? How could you live without air, water, and the earth to sustain you, which are elements of the Divine Mother? We would not even exist without the Great Cosmic Life Force that is imbued in everything. She helps us be all we can be. 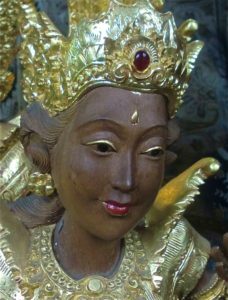 In Bali they have given shape to the Divine Mother, and they honor Her everywhere. All the families (and I mean ALL) do puja or worship together every single morning. They might even do this for two hours before going to work. They would never consider going to work without doing that. They weave little baskets and put offerings in them. Then they take these to put on the altars where they work. Every home has a temple in the middle of the home which is built first before anything. The whole family relates to sever different temples. (Apparently there are 10,000 temples on the island and they are all in use!) There is the indoor temple, the outdoor temple, the local town temple, the district temple and on and on— until you finally get to the great Divine Mother Temple on the mountain, which is supreme. There is an open air covered hall next to it with nothing inside. I asked my guide what it was for and he surprised me with his answer. He told me that is where the elder priests would meet to solve any big problem that came up on the entire island. The people are all so peaceful and beautiful and self assured. This I really attribute to their mild birth practices. The new born baby is kept held next to the parents’ body for months. When it is finally put down they do a religious ceremony. This practice of no separation changes everything in a culture I believe. I saw no overweight people, no angry people, no crime, no conflict. The people act out dramas on stage rather than in their personal lives. Each village has mastered a certain trade. One masters batik. Another silver, another wood carving, another baskets, another painting, another stoneware, etc. You can watch them do these crafts. All villages are cooperating with each other. When I attended a performance of Balinese dancers, my comment to God was, “These dancers have to be super advanced yogis.” I see no other way they could do these movements and mudras (sacred positions of the hands.) I found out that each dancer is chosen very young and spends his or her lifetime mastering one dance to perfection. The men also put themselves into a trance and do a dance that includes fire walking. This seemed to me how they “rebirthed” themselves. Sometimes I would take horse drawn carriages at night and go into bliss. I was happy inhaling the combination of very exotic aromas: the temple incense, the clove cigarettes, exotic fresh fruits hanging on the trees, and very exotic flowers everywhere. The combination of these aromas was intoxicating. At the same time you can hear the beautiful temple music being played. One day I saw one hundred women walking in a row, all dressed perfectly in batik. Each was carrying an elaborate huge headdress made of fruit and flowers. I ran after them to see where they were going. They went to the beach and kneeled down a placed batik cloths down to form and altar, and then they placed the fruit and flowers as an offering. I was amazed how no fruit had fallen off their heads. Then they bowed down. It was amazing. I was so lucky to see this special thing happening. I was told that was the day all of Bali people prayed for families. These ladies were all manifestations of the Divine Mother! That day I received the knowledge of how to do the God Training. When Markus came into my life I could not wait to take him to Bali. Needless to say, he was as blown away as I was. The first night I heard a voice that said :”This is the real Divine Mother. Tell Markus he will never be unhappy again.” And he hasn’t. We immediately made plans to come every year after that and bring groups. We have taken people on the Bali Quest since 2010. 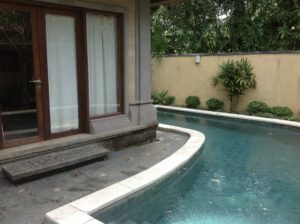 Markus found an amazing Villa in Ubud (The artistic center) where we always go. It is typical Balinese and the family takes exquisite care of us all. Each villa has its own swimming pool and a gorgeous open-air bathroom filled with immensely beautiful plants and flowers. The rooms are large and inviting. Each villa is walled around for complete privacy. Here we provide a chance for people to learn how to rebirth another person. We do conscious, connected energy breathing sessions every day. We supervise them, so each person receives training in how to become a breathworker. 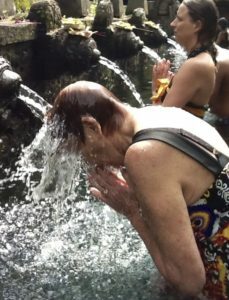 We visit the best possible sites around Bali such as the immortal pools at Tirta Empul, where all the ley lines are cleansed. We visit the most important temples and we have a driver who is like a Saint. We also go to ancient fire ceremonies run by Babaji devotees. The Bali Quest is one of my favorite things that we offer people. They always feel transformed just from the energy of Bali. And then to have a Liberation Breathing session every day in that energy is magnificent. Most of us in the West do not really have a concept of the Divine Mother. Probably the closest we get to that is the Christian Mother Mary, the Mother of Jesus. The indigenous peoples had a sense of the Earth Mother, and the Spirit Father. This is most close to the Divine Mother I am talking about. But she is much more than just the ruler of earth energies and animal totems. There is the creative force of manifestation in the whole Cosmos. In India they say nothing is higher than worship of the Divine Mother. Having been to India over 45 times, I can honestly say they are right on track. Without us in the West honoring the Sacred Feminine (outside of our traditional patriarchal complex,) we are just cheating ourselves of this Force of Divine Love and Manifestation that can help us correct our problems. She does not offer solutions; SHE IS the solution. Come to Bali and find out !